PowerEYE is an application to receive and store power readings (watts) from the Rainforest Eagle HAN device by implementing a listener for the Eagle Uploader API. It even pushes the data into your Universal Devices ISY-994 home controller (if you have one). It stores all power reading information on your local networked computer in an embedded database with a configurable location and is only exposed through this WebApp. A responsive Web Application for use through a web browser using AJAX and html5. Specifically target Android Pad size format. The PowerEYE servlet also provides your archived power, energy and pricing information to external applications on demand via HTTP requests that mimic REST style URLs. It is NOT a full REST implementation - it only listens to http GET methods, and really only mimics REST URLs, but it works. It provides the data as XML format responses. 'recent' requests dump the number of readings in the PowerEYE cache - as of PowerEYE version 1.0, this cache size is a configurable parameter set in the options page. Try them out on your own PowerEYE install, to see what they give you. If you have a Universal Devices ISY-994 configured, this PowerEYE servlet will push the current power, energy (meter reading) and current price to 3 state variables in the ISY. NOTE:the power reading gets updated (pushed) every ~10 seconds. 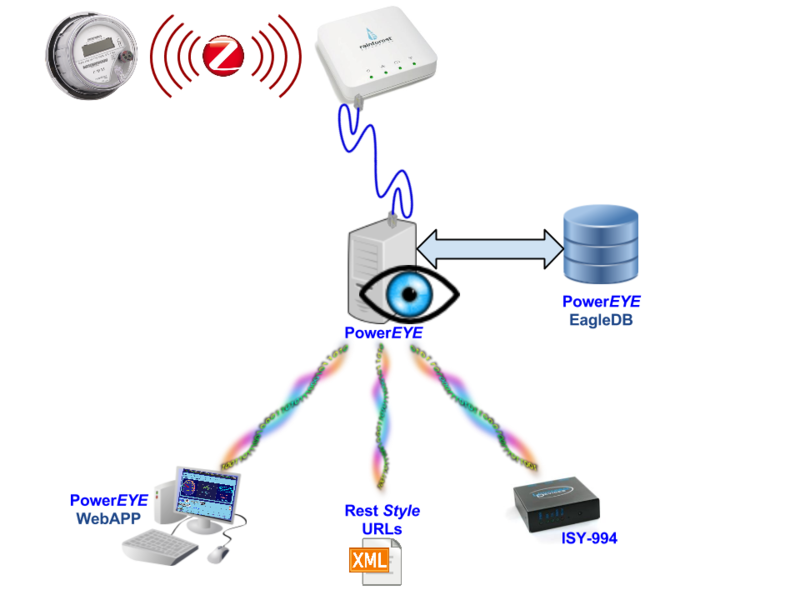 You can control your Universal Devices ISY-994 Insteon devices from within PowerEYE! Turn ON/OFF your lights or other controlled electric devices and then see the changes in power use, all in one WebApplication, from your phone, pad or computer. Your devices show up on the PowerEYE Devices page when you have your ISY-994 configured. All the source code is included in the download packages. See the powereye/WEB-INF/src directory. The PowerEYE listener servlet uses and includes the com.oreilly.servlet package (from http://www.servlets.com/cos/) to help out. The source code, object code, and documentation in the com.oreilly.servlet package is copyright and owned by Jason Hunter. Further licensing details are in the included PowerEYEWebAPP-LICENSE.txt and online. The database used by PowerEYE is an Apache Derby embedded instance. It stores ALL the messages that the Eagle sends out so you can go back to them and analyze them any which way you want. The DB files are in a sub-directory called EagleDB. The web presentation pages are exposed through a (optionaly secure SSL) Java WebAPP. It uses an Advanced jQuery and HTML5 UI framework called jQWidgets for all its functional widgets. jQWidgets is NOT free for commercial use, however it is available for conditional non-commercial use (jQWidgets License) under the Creative Commons Attribution-NonCommercial 3.0 License. This WebAPP must only be used for non-commercial personal use. Utility customers are allowed (and encouraged) to use PowerEYE for their personal use. the WebARTS library of widgets and tools. You are allowed to use and run all components of this application for your personal use for free. are licensed under GNU General Public License.